I like swimming. I go to school. I like running with my friends. I like pizza and yogurt and turkey and cheese. I love my whole family and my friends. I have a special belly and I have to take enzymes when I eat. Enzymes help me digest my food. They make me strong! I exercise so I can have muscles and a healthy body. I like running! I like to run and climb all the walls at the Spartan races. A mommy. To be a mommy means to love people. Jacqueline is a four-year-old girl with cystic fibrosis. To keep healthy, Jacqueline participates in many sports and activities to keep her body moving. 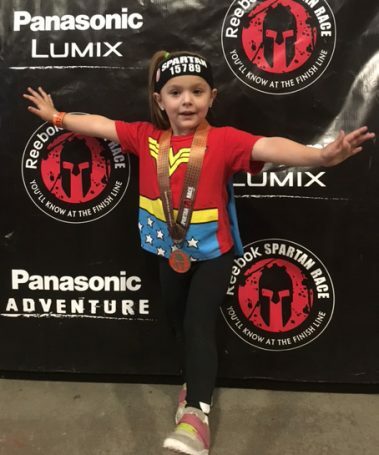 She runs track, is on the soccer team, swims, and loves participating in kiddie Cross Fit and kiddie (no mud) Spartan races. She is a cheerful and happy little girl with a competitive streak and a warm heart. She battles CF every day with courage and class. She truly is a special little girl and is so excited to be athlete of the month!